8 December 2016, the NH90 Sea Lion naval multi-role helicopter took off on its on-schedule maiden flight at Airbus Helicopters in Donauwörth. Wolfgang Schoder, CEO of Airbus Helicopters Deutschland; Ralph Herzog, Director in the Federal Office of Bundeswehr Equipment, Information Technology and In-Service Support (BAAINBw) and Vice Admiral Andreas Krause, Chief of the German Navy welcomed this important milestone in the programme. «We are proud to be delivering this state-of-the-art naval helicopter to the German Armed Forces on time», said Wolfgang Schoder. «This new generation of NH90 naval helicopters, the Sea Lion, has benefited from experience gathered by other countries who have been using it». The NH90 has an increased number of sensors and improved navigation and communications equipment, which means that this military helicopter will also be able to operate in civil air space. The military friend/foe identification has also been updated to the latest standards. For the BAAINBw in Koblenz, the Sea Lion is also a special project: «We need to keep to a tight schedule if we are to replace the Sea King in time. This requires all those participating in the project to coordinate quickly and efficiently to achieve this», explained Ralph Herzog. «By using an existing NH90 model as the basis for the Sea Lion and adding the required additional functionalities to it, we have been able to significantly reduce the delivery process. This model is also configured not only to be an adequate replacement for the Sea King but is designed so that it can be adapted to future roles». «The Navy is looking forward, as the first customer, to be receiving the NH90 Sea Lion on time by the end of 2019», said Vice Admiral Andreas Krause. «We are now expecting a successful test phase». Meanwhile, the Navy is preparing intensively for the acceptance of the helicopters with technical and flight personnel already training. Further measures have commenced at their future home, the Nordholz naval air base. Infrastructural changes and new buildings are necessary. Deliveries of NH90 Sea Lions to the Navy will start at the end of 2019. When deployed, it will take on a range of roles including search and rescue (SAR) missions, maritime reconnaissance, special forces missions as well as personnel and materiel transportation tasks. The German Armed Forces have ordered 18 of these helicopters altogether, with the last due to go into service in 2022. 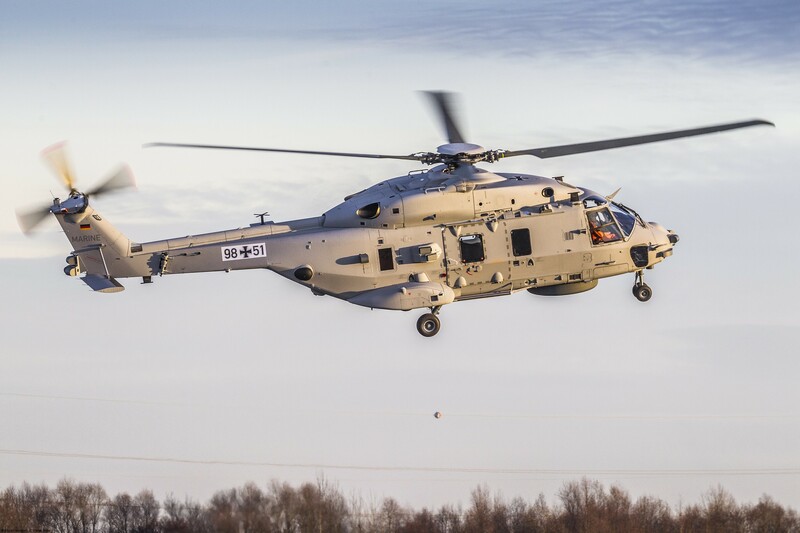 The second NH90 Sea Lion awaiting qualification testing is currently at the final assembly stage and series production at Donauwörth will commence in the summer of 2017. In addition to its land-based use in SAR missions, the NH90 Sea Lion is also intended to operate on Type 702 (Berlin class) combat support ships. Thanks to its multi-role capability and future proofing, the Sea Lion will not merely replace the Bundeswehr’s Sea King Mk41 fleet but significantly enhance the Navy’s operational capabilities. The electronic fly-by-wire flight controls of the NH90 Sea Lion reduce the crew’s workload. Other benefits of this control system are its high precision and ease of use, which particularly come to the fore in over-water hovering, even in poor weather conditions.